Brig. 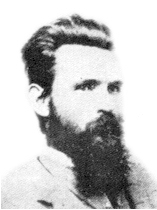 Gen. John Gregg, C. S. Army, commanding Confederate forces. MAJOR: While in camp 2 miles east of Jackson, Miss., at 3 a.m. on the 11th instant, I received a dispatch from the lieutenant-general commanding, directing me to move my brigade promptly to Raymond, and I was directed to use Wirt Adams' cavalry, at Raymond, for advanced pickets. By 5 o'clock the entire brigade was on the march, and at 4 p.m. we were at camp near Raymond. Upon my arrival I found the people in great consternation, being under the impression that the enemy were advancing from Port Gibson. I found none of Colonel Adams' cavalry except a single sergeant and 4 men. There was a small State company, under the command of Captain Hall, who were, as I was informed, scouting in the direction of Port Gibson. I immediately sent forward Sergeant Miles and 4 men to put themselves in communication with Captain Hall, and bring me what information of the enemy's movements could be obtained. I also placed strong infantry pickets on the road leading out southwardly and to the west. In the mean time I had dispatched Colonel Adams to move his command to Raymond, unless otherwise ordered by Lieutenant-General Pemberton, his command being at Edwards Depot. During the night Captain [W. R.] Luckett, with a squadron of 50 men, reported to me, and informed me that, having been ordered by Colonel Adams to picket the road leading from Raymond to Port Gibson and communicate with me, he had attempted to pass directly from Edwards Depot to the road below, without passing through Raymond, but had met the enemy at Dillon's, 9 miles distant from Raymond, and, being unable to pass, had returned. Fearing that it might be the purpose of the enemy to travel some one of the roads leading northeasterly into the road from Raymond to Jackson, and thus intercept my line of retreat, I ordered Captain [W. S.] Yerger, who had now come up and assumed command of the squadron, to picket all these roads, and give me early information of the enemy's movements in that direction. Early next morning I was informed by couriers from Captain Hall that the enemy were advancing rapidly by the road from Utica. Owing to the smallness of the mounted force (Captain Hall having but 40 men, and these mostly youths from the neighborhood), I was unable to ascertain anything concerning the strength of the enemy. A dispatch from the lieutenant-general commanding intimated that the purpose of the enemy was supposed to be an advance upon Edwards Depot, and I inferred from it that it was possible that the force in front of me was a brigade on a marauding excursion. I was strengthened in this opinion by my scouts, who reported that the force they had seen was about 2,500 or 3,000. It was absolutely necessary for me to await their coming, or to fall back without knowing whether the force of the enemy was superior or inferior to my own. The enemy moved up rapidly, and commenced an artillery fire upon my picket post at 10 o'clock. In the mean time I had moved the Seventh Texas Regiment (Colonel [H. B.] Granbury) to support the picket at the junction of the Port Gibson and Utica roads, and had moved the Fiftieth Tennessee Regiment (Lieutenant-Colonel [T. W.] Beaumont) out on the Lower Gallatin road, and ordered out the Tenth and Thirtieth Tennessee Regiments, consolidated (Col. R. W. MacGavock), to support it. I also ordered up the Third Tennessee Regiment (Col. C. H. Walker), a half mile out, and placed it in position between the roads. A single field, dotted with spots of timber, separated the Lower Gallatin and Utica roads, and the main force of the enemy was on the latter road. Finding that I would necessarily be driven into town by his artillery unless I moved up nearer, and believing from the evidence I had that his force was a single brigade, I made my dispositions to capture it. I moved the Fiftieth, Tenth, and Thirtieth Tennessee across a portion of the field into the timber, to fall upon the enemy in rear of his battery, with instructions that they were to approach the enemy as near as possible and wait an attack by our right. I placed Captain [H. M.] Bledsoe, with his three pieces of artillery, on the road leading to Utica and Port Gibson, near their junction, directing him to select the most commanding position. Near the artillery I posted the First Tennessee Battalion. I then ordered up the Third Tennessee into the open field to the right of the Tenth and Thirtieth Tennessee, and the Seventh Texas I moved by the left flank behind some timber to the right of the Third Tennessee. I then sent back an order to the Forty-first Tennessee (Colonel [R.] Farquharson) to move his regiment to the position just before occupied by the Third Tennessee. I then ordered forward both the Seventh Texas and Third Tennessee into the timber behind which the enemy's battery was posted, the enemy's skirmishers having already been firing upon them from that wood. Skirmishers being advanced, they moved forward in gallant style, and hardly lost a man until they entered the timber. The enemy was drawn up in two lines, but both lines were scattered immediately and fell back in a few minutes, but the enemy continued to re-enforce with fresh troops. The firing of musketry was rapid and continuous for more than two hours, and in that time I learned from Colonel Beaumont that no attack was made by the Fiftieth because of the immense force which extended back in the wood as far as he could see, and because the enemy were advancing a large force on his left flank. Owing to the failure of the Fiftieth, Tenth, and Thirtieth Tennessee to attack, the enemy were enabled to place a force upon the left flank of the Third Tennessee. I immediately ordered up the Forty-first to relieve the left of the Third Tennessee. Colonel Farquharson moved up in good order and took position promptly. By this time the superior force of the enemy had driven back the Seventh Texas and Third Tennessee, after great loss from both these regiments. Their retreat was protected by the Forty-first Tennessee, and the enemy having moved up on the left of our line, and having engaged the Tenth, Thirtieth, and Fiftieth Tennessee, the Forty-first also acted as a support to them. In this part of the engagement Col. R. W. MacGavock, of the Tenth Tennessee (commanding the consolidated Tenth and Thirtieth), was killed, and Lieutenant-Colonel [J. J.] Turner, of the Thirtieth, took command. Receiving a dispatch at this time from Colonel Adams stating that the enemy had a large supporting force advancing, I ordered all the regiments to withdraw, which was effected in admirable order. Captain Bledsoe, with his artillery (one of the pieces of which burst during the engagement), continued during the whole day to keep back the enemy from advancing either through the open field or by the road, and I have reason to think did great execution among his lines. During the engagement I ordered up Major [S. H.] Colms with his battalion (First Tennessee) upon the right of our line, to prevent the enemy from throwing forward any part of his force between my own and the town, and he here engaged the enemy also. After the retrograde movement was commenced, Colonel [A. P.] Thompson, of the Third Kentucky, with six companies of mounted troops, reported to me, having Just arrived from Jackson. I immediately placed this force in position, together with Captain Bledsoe and his two remaining pieces, and this position they held until the infantry had moved some distance in the direction of Jackson, when they withdrew by my direction. I cannot speak in terms of commendation too high of the coolness and judgment manifested by the commanders of the different regiments. Col. R. W. MacGavock, of the Tenth Tennessee (commanding Tenth and Thirtieth Tennessee consolidated), was killed while gallantly urging his command to the conflict. Lieutenant-Colonel Beaumont was stricken on the head by a rifle-ball, and for a time disabled while in the midst of the action. To all the commanding officers of regiments and battalions my thanks are due for the courage and skill displayed by them in the management of their commands, and I cannot too much applaud the judgment and coolness with which their efforts were seconded by the other field and company officers. The losses will be seen by reference to the reports hereto annexed. It will be seen that they were severe, especially in the Seventh Texas and Third Tennessee. The aggregate of killed in the brigade was 73; wounded, 229; missing. 204. Of this number there were killed in the Forty-first Tennessee, 2; wounded, 7. In the First Tennessee battalion, killed, 3; wounded, 9. In the Fiftieth Tennessee, killed, 4; wounded, 8. In the Tenth and Thirtieth Tennessee (consolidated), killed, 15; wounded, 59. In the Seventh Texas, killed, 22; wounded, 66. In the Third Tennessee, killed, 27; wounded, 90. It will be seen that the Third Tennessee and Seventh Texas were in the most trying part of the engagement. Prisoners taken b v the enemy and escaped to us report the enemy's loss at 150 killed and 400 wounded. I consider their statements reliable. Our aggregate engaged was 2,500. I have ascertained that the enemy had in the field three divisions, but the division commanded by Major-General Logan was the one particularly engaged. My command was encamped for the night, together with 1,000 men brought up by Brig. Gen. W. H. T. Walker, 5 miles from the battle-field.